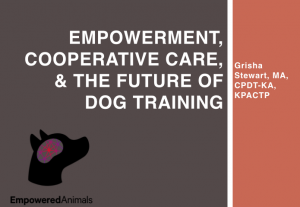 Online seminar recorded November 10, 2015 - Presented by: Grisha Stewart MA, CPDT-KA, KPACTP. 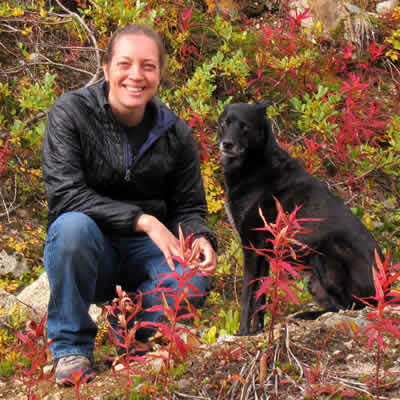 Dog training practices and philosophies are always changing based on science and innovative techniques from trainers and behaviorists in the field. Change is hard, but if you have an idea of where you might be going, it's a little easier! If you purchase this video below, just refresh the page and it will show up right here. Use the form below to purchase the streaming recording, with a nice bonus: one FREE month of Student membership in ABBA, for extra support and a chance to ask questions. There are no strings attached. The membership will not renew automatically and you will keep access to this event recording indefinitely. What was considered to be modern or 'balanced' 10 years ago has faded into 'old-fashioned' training as people discover even better ways to address problems and empower choices. 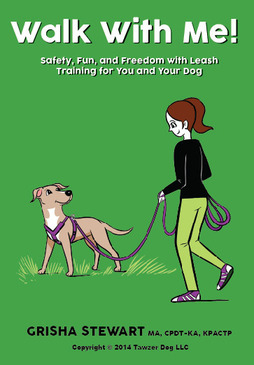 It's not enough any more to train with a focus on reinforcement and avoid giving leash corrections. Don't get me wrong, that's a good start, but there's more. In my travels around the world to teach seminars, I have seen a wide variety of perspectives on the role of the trainer, what dogs can and should learn, and how they should best learn those lessons. This 1.5 hour seminar shares my perspective on where I see animal training going and what benefits that can have for the dogs and other animals in our care. If you are already a member or have made a purchase at ABBA before, please log in with the user info you created. I mentioned that the 2-way communication info was covered in depth in the Talk With Me video, which was part of the BAT 2.0 Empowered Animals video series. They're available in streaming format through my site or as DVDs from Tawzer Dog. If you like this seminar, please help me out by sharing this page on Facebook! Previous PostShould You Correct the Dog for Disobeying After He KNOWS the Training?Next PostHow Do I Get My Dog to Pay Attention?